You are here: Home / Blog / News & Events / Let’s Celebrate! RSVP by end of day Friday! Let’s Celebrate! RSVP by end of day Friday! The Artwalk St. James and Billboard projects are complete! Join us for a free celebratory dinner on Monday, April 2nd at the Legion. 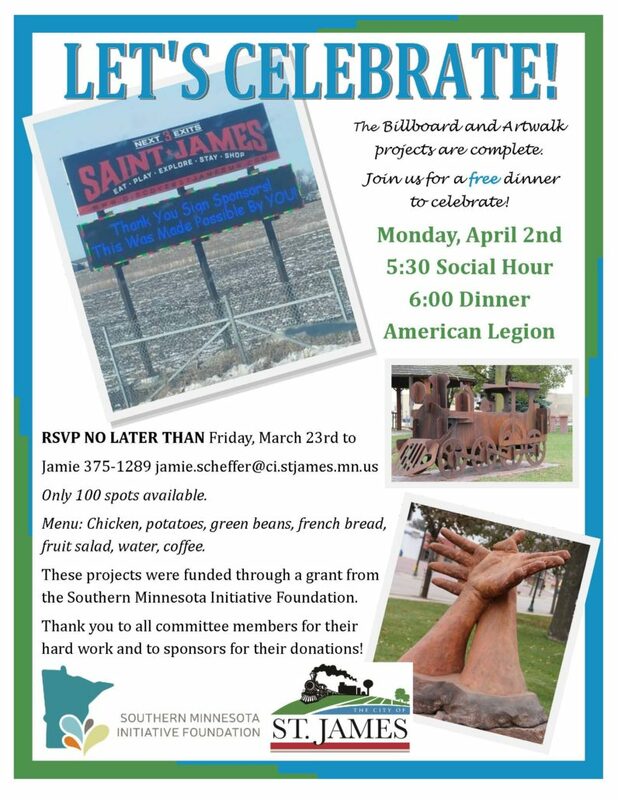 https://discoverstjamesmn.com/wp-content/uploads/2018/03/Lets-Celebrate.jpg 2200 1700 Jamie Scheffer https://discoverstjamesmn.com/wp-content/uploads/2017/03/logo-300x101.png Jamie Scheffer2018-03-20 19:58:192018-04-18 15:39:49Let's Celebrate! RSVP by end of day Friday!